What is The Potato Foundation? THE POTATO FOUNDATION’s focus is on the neglected and forgotten children of our society. 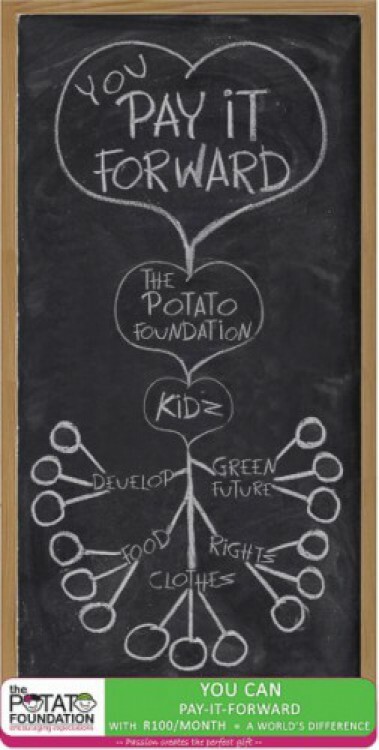 THE POTATO FOUNDATION was established in February 2007 and the name of the organisation was adopted around the growth concept of a potato. GIVING is very much like a potato - its roots are hidden and the growing effect thereof is not visible until the potato is harvested. We believe that PASSION creates the PERFECT GIFT! The Potato Foundation aims to be exactly that - the roots within our community sustaining and nurturing assistance to uplift and empower children and give them an opportunity to take their rightful place in society. This is where YOUR skills, aptitude and time can contribute to the greater good in your communities. This surely is a very effective and sustainable way your skills can manifest and to see the change in society, with the helping hands and guidance of THE POTATO FOUNDATION. This is achieved by requesting the individual volunteer, businesses, and schools to actively get involved in the projects they support financially. We also believe in the principle of giving fishing rods rather than fishes. The old Chinese saying: Give a man a fish and you feed him for a day. Teach a man to fish and you feed him for a lifetime. Just imagine if we can contribute to kids at a young age already? Project institutions must become a part of the upliftment of their community.